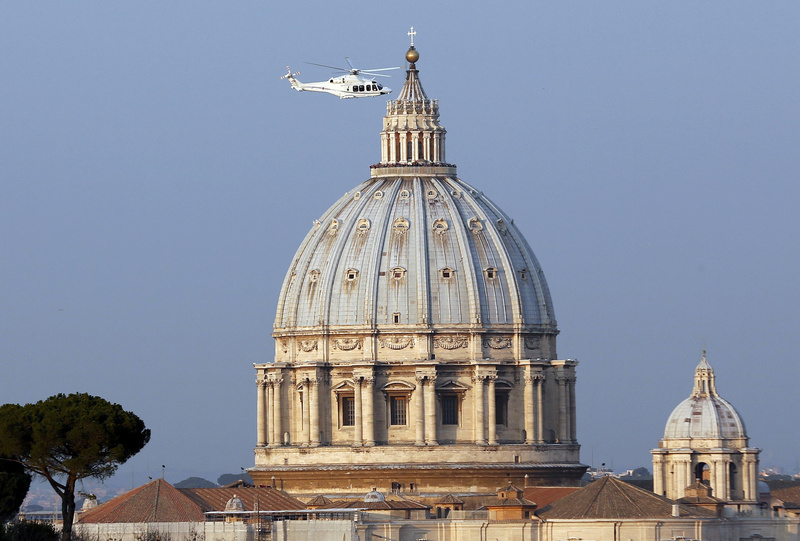 VATICAN CITY (CNS) — Pope Benedict XVI’s final trip as pope was a 15-minute helicopter ride from the Vatican to the papal summer villa at Castel Gandolfo. He was joined in the Italian government chopper by his personal secretary and assistant secretary, his personal physician, his new valet and an official of the Prefecture of the Pontifical Household. Almost all 100 members of the Swiss Guard, dressed in their colorful medieval uniforms, were standing at attention in the San Damaso Courtyard of the Apostolic Palace to formally salute the man they had pledged their lives to protect. For the last three hours of Pope Benedict’s pontificate, the rest of the guards were stationed at the entrances to Vatican City, at the heliport in the Vatican Gardens and at the papal villa in Castel Gandolfo. Joining the Swiss Guards in the courtyard were dozens of bishops, monsignors, priests, nuns and laypeople who work in the Vatican Secretariat of State and other offices nearby. The pope greeted his vicars for Vatican City and Rome — Cardinals Angelo Comastri and Agostino Vallini — before using his to cane walk down a few steps into the courtyard. He was greeted with applause. The pope’s driver knelt in front of him, kissed his ring and burst into tears. As soon as the pope’s car pulled away, the bells of St. Peter’s Basilica began tolling their farewell. 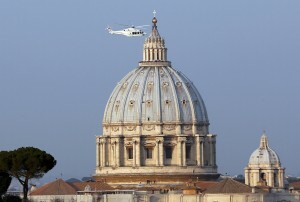 Driven to the helipad in the Vatican Gardens, his flight to Castel Gandolfo began at 5:07 p.m.